When you fall in love with someone, you fall in stages. First, you might fall for the way they look. Next, you fall for the way they laugh and enjoy life. After that, it might be the way you share similar interests or fun adventures. 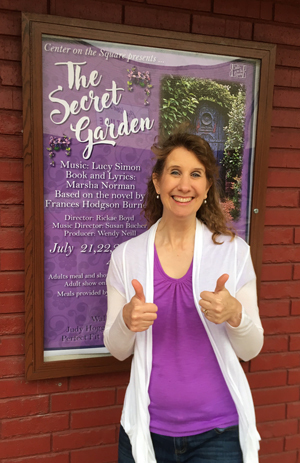 I fell for “The Secret Garden” musical in stages. And it was contagious. I fell in love with the music first. A friend let me borrow her CD of this mesmerizing musical seven years ago. Like “Wicked”, “Les Mis” or “Hamilton”, I found myself listening to it over and over. I couldn’t pick which song was my favorite because there were so many great ones to choose from. One song would start me waltzing across my kitchen while cooking dinner. Another would leave me crying like a baby, even after hearing it for the umpteenth time. Next, I fell for the story. The more I listened, the more I heard love and purpose overcoming loss and neglect. Several of the characters feel alone in the world after losing a loved one. Lily’s secret garden has also been neglected and, at first glance, appears to be dead. But Dickon the wanderer knows that if there is even a little bit of life in it, a plant or tree can be brought back to full bloom. “If a thing is ‘wick’, it will grow,” he says. As the characters bring the garden back to life, they too find new life and start to care more about one another in the process. They too are “wick”. Finally, I fell in love with the idea of bringing together cast members of all ages. Most plays and musicals use actors and actresses in their twenties. If you aren’t that age, roles are harder to come by. I loved how this musical provides roles for people in various stages of life, and the spotlight gets passed around. At a time when our country finds itself divided on many issues, it is so refreshing to bring together people of different ages and races to work together toward a goal. So I started asking directors in town to consider doing this show. Most either hadn’t heard of it, or knew that it was a very challenging show to produce. But I would not be dissuaded. Finally, my friends Rickae Boyd and Susan Bucher took the plunge with me. Rickae agreed to be the director, Susan the music director, I would be the producer, and we got approval from the board at Center on the Square. I told Rickae I was dreaming of singing the role of Lily, but that I would audition like everyone else and would submit to her decision whether to cast me. After auditions, she told me “You are our Lily.” I was on Cloud Nine. Rickae also cast my husband as Archibald, Lily’s husband. That would be the “cherry on top” because my husband is an incredible tenor and I love singing with him. But I didn’t dare get too excited, because there was one catch: my husband’s voice had not been working for a year and a half, due to some vocal paralysis. Rickae wanted to cast him because he had an appointment with a voice specialist in Philadelphia and we were hopeful God would provide us with some answers. Unfortunately, it was not to be. The specialist only offered some long-term hope. I was sad, but not surprised. Kelly and I have had various chronic health problems and have learned that God is in control, even when we don’t have the answers we want. We already had my friend Josh Brown in place as the understudy for Archibald and I knew he would do a great job as well. My love for the show became contagious, and we quickly raised money to pay for the royalties. 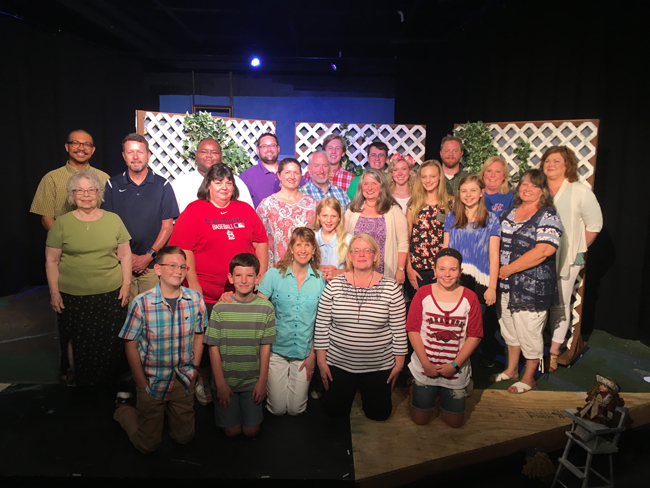 My friends Judy Hoggard and Kathi Merritt at REMAX, Nancy Hatfield at Sowell’s, Josh Aich at Walmart, Tim Kamerman at Chiropractic Care Clinic, Mandy Heaton at Southern Bank, Dr. Annie Luy, and Dr. Dana Province were all willing to invest in this great community show. The obstacles of finding funding and a director were overcome, but more obstacles would appear before this dream would be a reality. After we “finalized” the cast list, it didn’t take long before we were having to revise it repeatedly. We were beleaguered with medical problems, and I don’t mean the common cold. One cast member had to have open-heart surgery. Another had to drop out because his mother took a turn for the worse. Others went to ER for various issues. The most devastating blow came when Cliff Roberts, our wonderful 70-something in the role of Ben, had a major stroke. He is now in rehab making courageous strides toward walking and talking again. 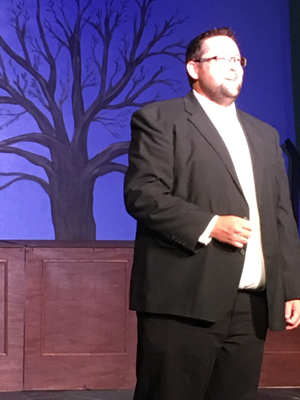 Jeff Kellar stepped in to take his place and did a great job. 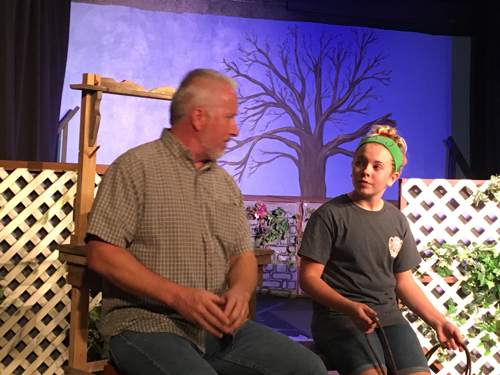 We continued to adjust to these obstacles and still had a fantastic cast with actors ranging from age 10 to age 83! I was especially amazed at the talent and enthusiasm of the kids playing the four children’s roles. 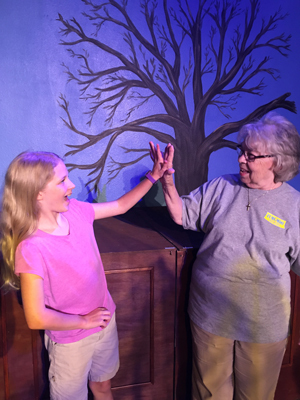 Brianna Foust, our 10 year old “Mary” came to the first read-through and had obviously already worked extensively on the script at home. She had the British accent down pat, and when seasoned actor Josh Strickland started “yelling” at her (as Dr. Neville Craven), she didn’t blink an eye, but yelled right back as Mary. We continued to rehearse throughout the summer and various people bought into the dream and worked to make it happen. Patrick Reilly, owner of Quality Office in town, worked with us on set and poster design. We all pitched in to paint the set pieces that our talented set builder, Doug Yaeger had finished weeks ahead of the show. 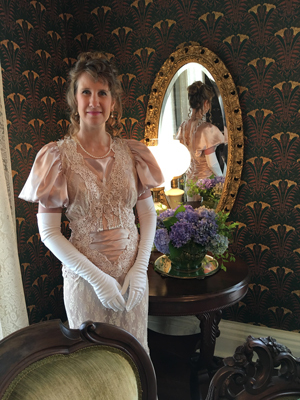 Pam Green managed to costume all of us for the early 1900s. Susan recruited some incredible musicians to be our small orchestra, all volunteers. Finally, we found a very talented high schooler, Alison Pruitt, to design our lighting. To promote the show, Brianna Foust (Mary), Myles Kreh (Dickon) and I went to the Searcy Library and did a “Sneak Peek” for families with children. We sang two of the songs in costume and read the descriptions of the garden to them from the book. Rebecca Taylor, who works there in the children’s section, teamed up with us and provided a Secret Garden craft for the kids along with a flower pot and seeds to plant. We encouraged the kids to read the book and to come see the show. I fell in love with this show seven years ago and now the time has come to share it. Along the way, my love for it spread to others and over 40 others have joined me in one way or another to make this happen. It is truly a community bringing this to the community. If you are reading this before August 6th, come see the show! We perform on July 21st, 22nd, 28th, 29th and August 4th, 5th, and 6th . You can buy tickets at http://centeronthesquare.org. If you are reading this after we are finished, come to another show in this season’s strong lineup at Center on the Square. You’ll see how your friends and neighbors are providing some exceptional entertainment for Searcy and the surrounding area. Better yet, come audition. Who knows, you too might fall in love with a show!